So the day continued with us going up up up after our brief sojourn at the mountain refuge with its circling vultures. Maybe they have had some luck there in the past – who knows – we were not going to be their dinner tonight! Michelle went on for a while and we passed the water fountain where everyone has to have a photo – henceforth so did we. By this time we had a little rain on and off and it was quite cold if we stopped for too long. Shortly after here was the sign for Navarra – we were now in Spain. No visa checks, no passports, barely noticeable except now every 50 metres were numbered posts which I don’t recall seeing last year and were no doubt for the benefit of rescue workers when things weren’t going so good for the pilgrims. I clearly recall this track in the wet last year! We were able to see the steep drops beside the tracks clearly and the heavily treed risky areas that may prove treacherous for pilgrims when the whether is bad. 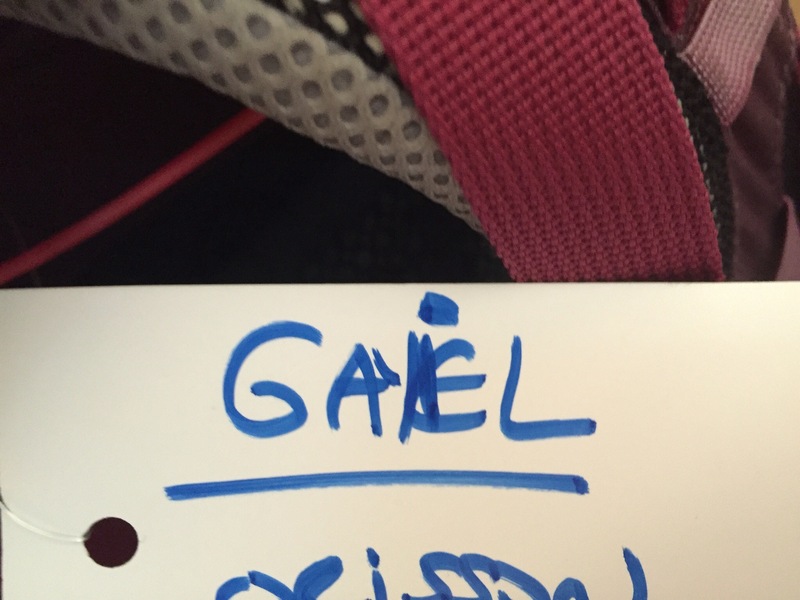 I caught up to Michelle and had another short break with shoes off in memory of the Mexican camino Angel last year. (You know the guy who appeared everywhere with shoes off every hour swearing you can walk forever). It was a little too cold to stay for long and while we rested a young gentleman from Greenland stopped briefly and looked at us and told us where he was from before engaging in an awkward silence for a couple of minutes. He may have been catching his breath and needing a rest but we both occupied the only rocks in the vicinity. After a few moments too long of awkward silence he turned and headed off up the road. Not everyone on the Camino is good for a chat! Michelle went on first as we headed to the last steep incline and the highest point of the pass at 1400m. I eventually passed a full size refuge which had been crowded with pilgrims whence my beloved and I had passed last year. Today it was empty with only a few belongings inside providing a glimpse into the past and the thousands of those who had gone before. 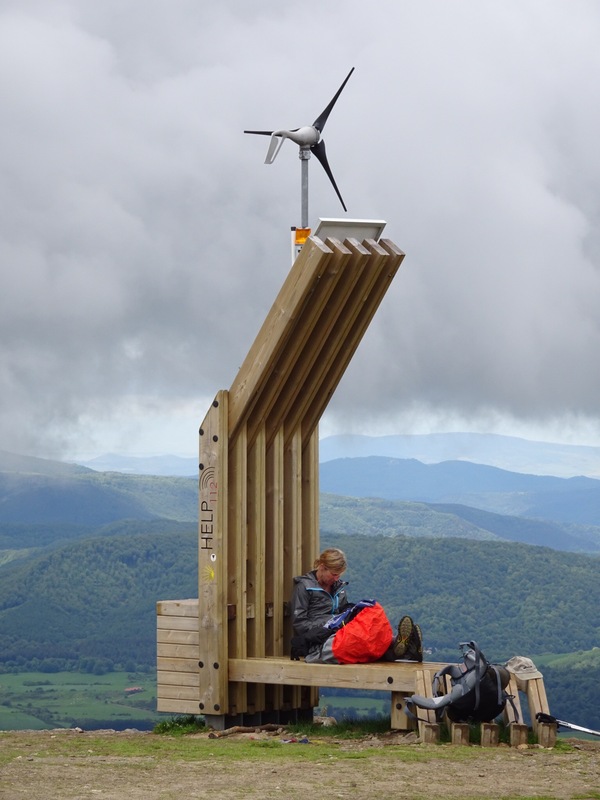 After a while I lost sight of Michelle and slowly but surely made my way up the mountain amidst sleet and threatening downpours to find her sitting under the last great monument of the Pyrenees – I seem to recall finding my beloved at this exact spot last year. Both had no doubt had time for a nap and a cup of tea (in this case with a touch of Scotch) and both feeling refreshed when I arrived. 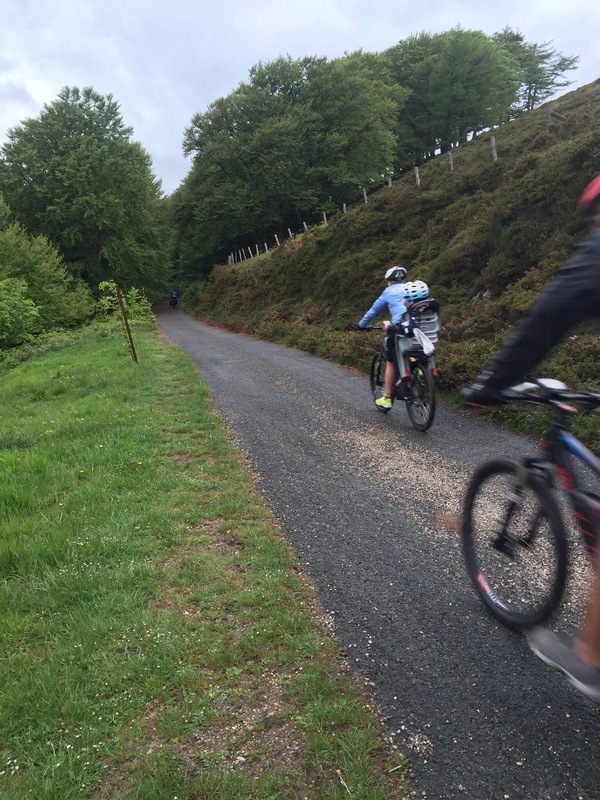 I had a couple of minutes breath catching – and we observed an Italian mother on a bike with her young son ready for the steep descent to Roncesvalles. 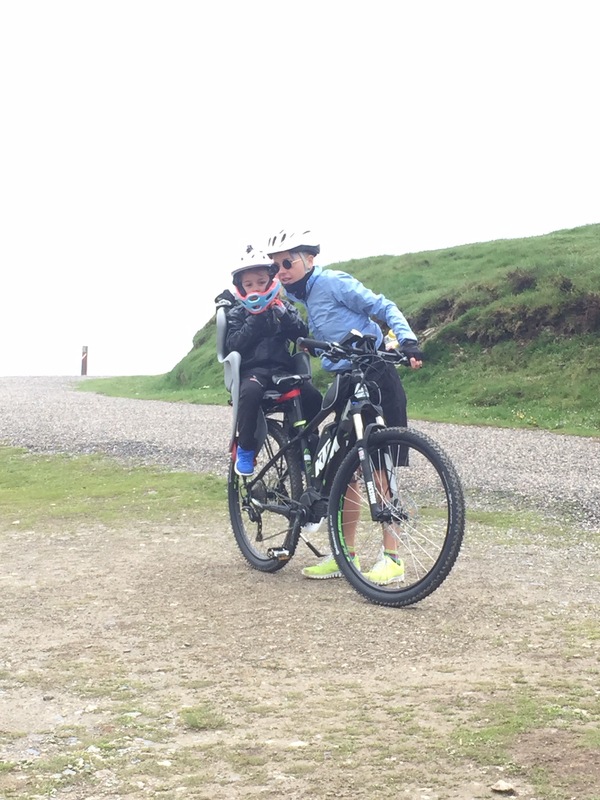 It was a little difficult to imagine how she had arrived at the top looking so relaxed after peddling her not so lightweight son up the hill. Maybe she did maybe she didn’t. 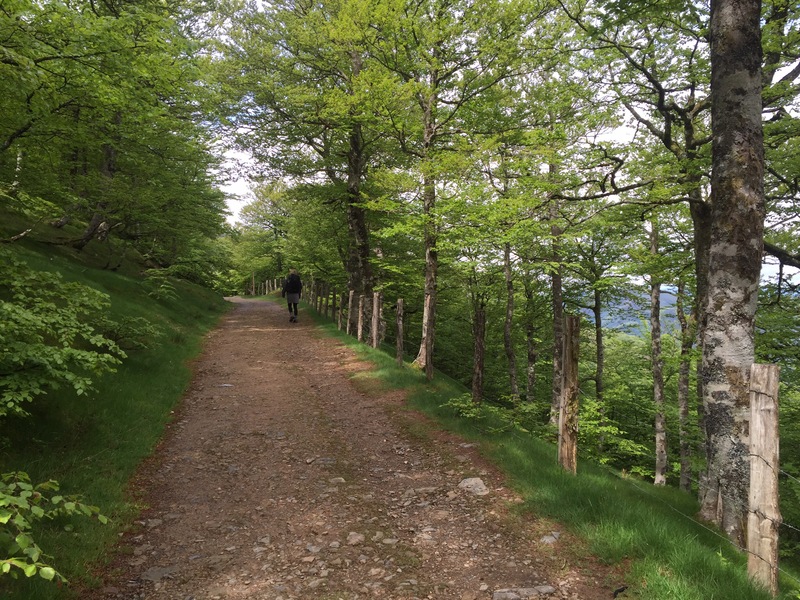 I have noticed bikers (and hikers) getting dropped off at different points along the way. We will never know. But as we descended on the right side track quite a few bike riders came zooming passed and she was one of them with son in tow. Likely he is a future daredevil or Ferrari driver! 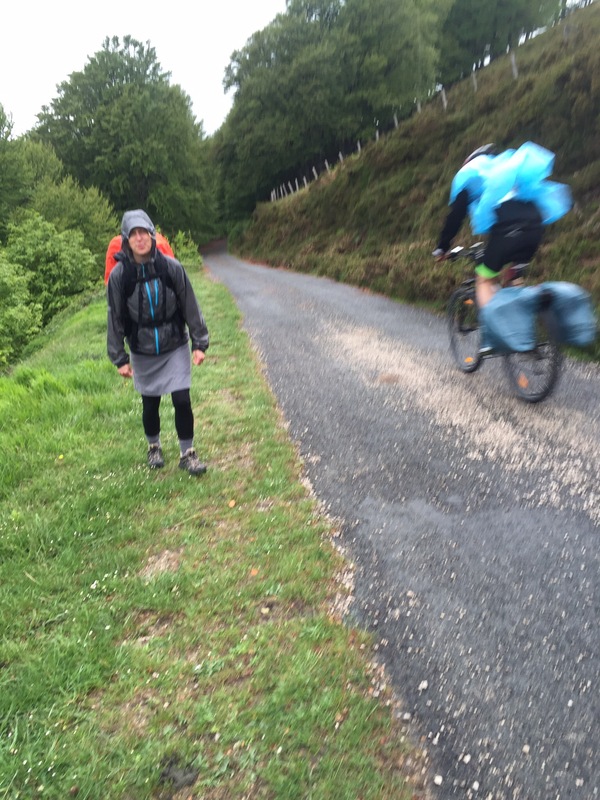 When we eventually reached the bottom a downpour hit again as we headed along the flat into the back of Roncesvalles. 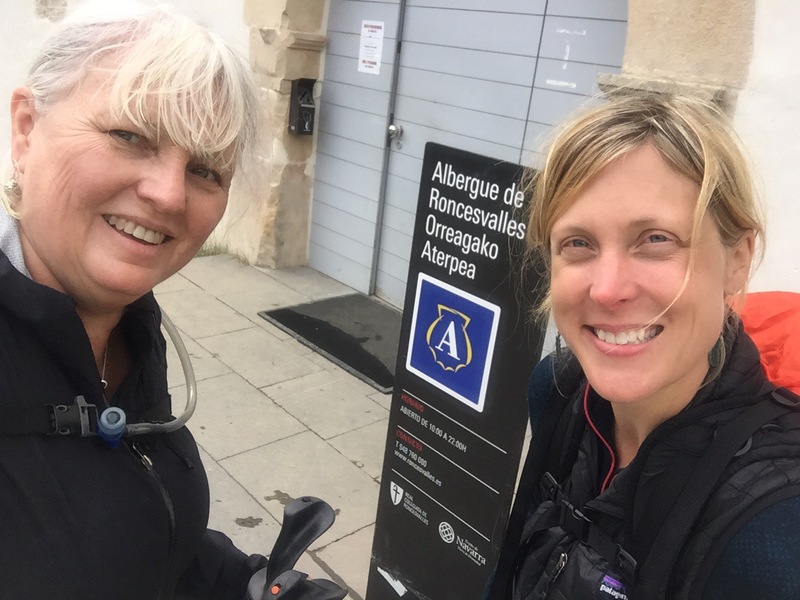 I was so thrilled to be arriving feeling how I imagine others did every day on the camino and I was so lucky to have Michelle as a companion. We snared a cubicle with two Korean ladies so there was a bit of a language barrier and not a lot of chit chat. I had a shower and hit the tens machine before heading out for a bit of a survey of the eating venues. I had suggested we look into things rather than buy the tickets at the checkin point as we had been disappointed last year (with the wine refill not the company). Anyway we managed a bite to eat in one bar and a drink in the other before heading back for a rest before the pilgrim welcoming mass. As expected the mass was crowded and I felt somewhat faint and had to leave before it had finished. It was unexpectedly hot inside and I realised I had not drank enough water during the later part of the day. Anyway I headed upstairs to the only real hotel in the town to discover we could eat there and, more importantly I could pay with a credit card. 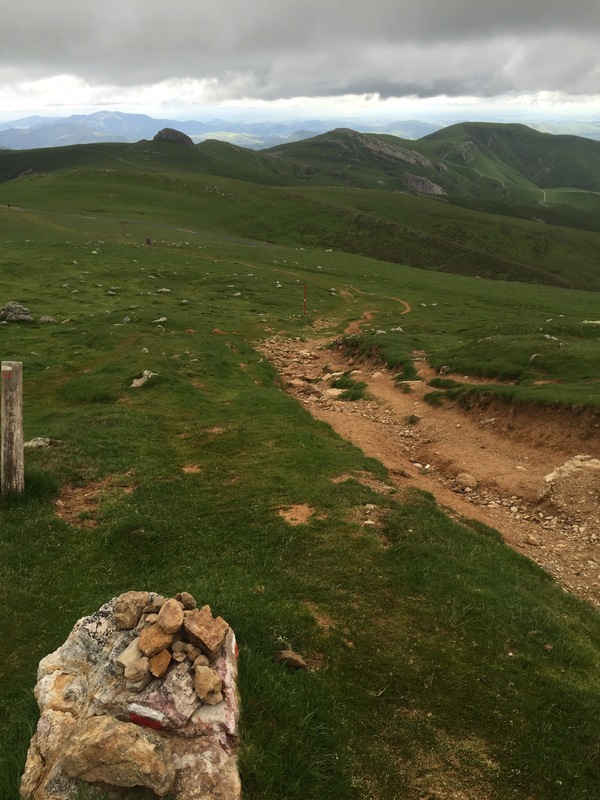 I owed Michelle some money and we were due to part ways in the morning and I had forgotten the scarcity of ATMS over this side of the Pyrenees! Whilst I was sitting on the steps outside the mass Michelle also snuck out! Apparently we did not go unnoticed as there were not too many people around with such light hair it seems. We had a nice meal (by local standards) and went to bed reasonably early after such an exhausting day. 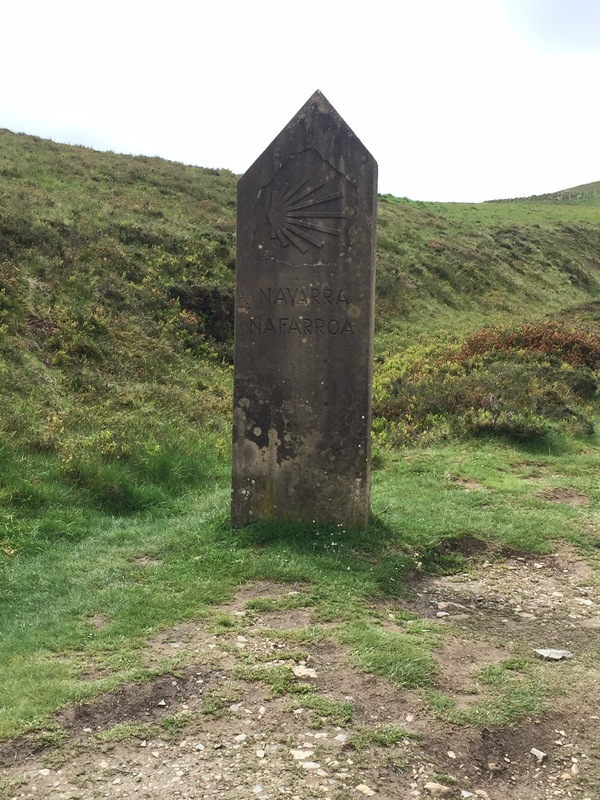 I was so glad to have made the trip the second time and, thanks to Michelle’s willingness to walk with me, I now know how other “normal” people must feel after a day on the Camino. 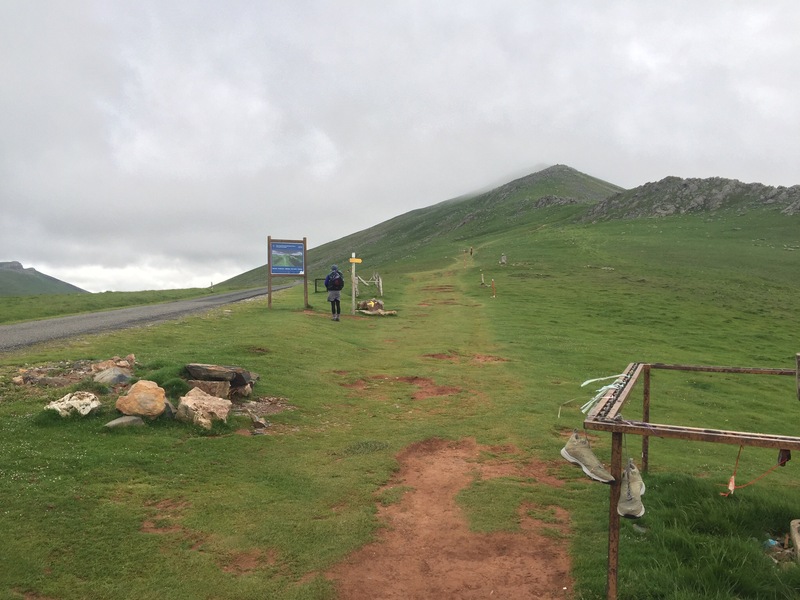 Tired, muscle ache and a real sense of achievement. I think I had all those and more last year – the more being excruciating agony after removing my boots in Roncesvalles. So glad I was in such great company – we had some great laughs and were lucky to have such great weather to catch the views! I will be sad to jump on the bus on the morrow! Buenos noches! 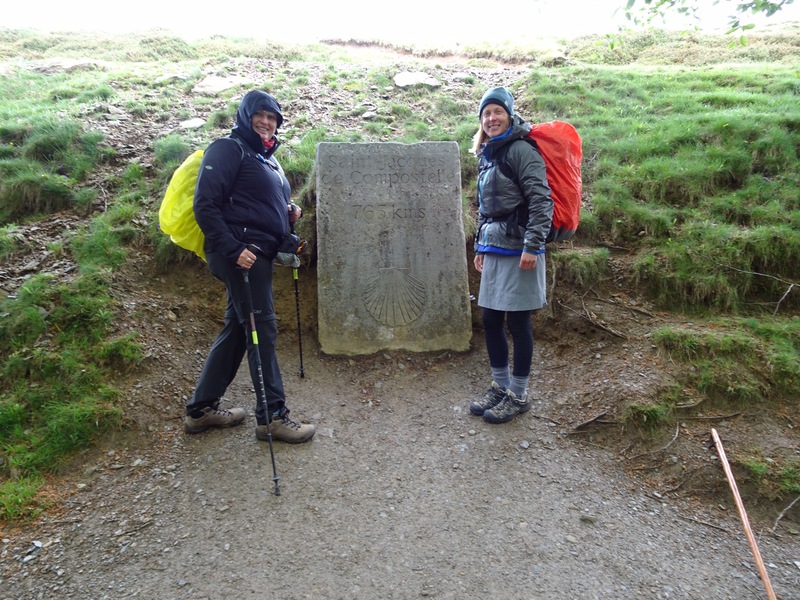 Next Post Farewell and the International Camino Packing Champions!